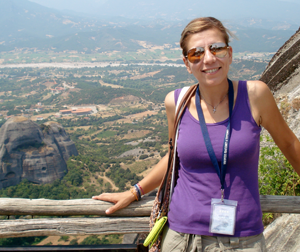 My name is DINA PAPAEFTHIMIOU and I work as a licenced guide in METEORA, in the area of Thessaly. I graduated the guide’s school of Athens in 2006 and since then I work as a guide, mostly, in Meteora. Starting from the town of Kalambaka, where I live permanently, I can guide groups or individuals in the monasteries of Meteora and the area around but also in the region of Epirus and Macedonia. Having a diploma of the University of Thessaloniki in Philosophy and Pedagogy gives me a further training for educational tours of schools and universities, so as to bring the students closer to the culture, the history, the religion and the modern life of Greece. I speak English, Italian and of course Greek. There is also the possibility of a guided tour in every other language with translation.